There are some developments in First class space that are quite nice (if you can pony up the miles). Both of them are incidentally on the A380. Singapore Suites on the A380 are now eligible for redemption through KrisFlyer miles. 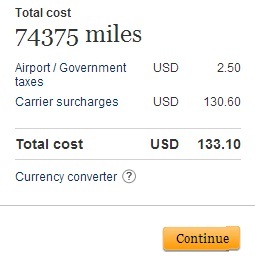 If you add the 15% discount for online bookings, a one way is just 74375 miles and ~150 dollars in taxes and fees! This makes me wish so much that Canadian AMEX Membership Rewards was a transfer partner with Krisflyer… although SPG partners with Krisflyer. For some reason, going to Singapore raises the taxes/surcharges much more, so the prime spots for redemption are the fifth freedom routes, especially HKG-SFO and NRT-LAX. Those are actually extremely good redemption rates. It’s on par with Avios, with around the same (if not less) fees on NRT-LAX and even cheaper for HKG-SFO!